Someone once said that to me and I'm not sure what they meant. Is it, "Do the things you talk about?" OK..... I do. Angelica, Dandelion root, Gentian root and Wormwood. I sat and looked at the recipe for at least a year because modern herbals give Angelica credit to being a very dangerous herb. Phooey, probably not as dangerous as swallowing a prescription pill. I do not recommend this to anyone unless they live their life by herbs. Terry, at My Journey With Candida, went on this cleanse with me (again) this past weekend. She is posting on it too and you can get a different angle from her. What a find when I first came upon her blog. It's exciting and comforting to share health experiences and I found a beautiful friend. Another natural healing tid-bit. Essiac tea or Herbal Extract prevents and cures most cancers. Of course, not sold in the US (although you can purchase the individual herbs and brew it yourself) so I order mine from Canada. I have a spot of skin cancer on my face, which is no surprise, because I'm in the sun all summer. It's been there for a couple of years but lately turned aggressive. I began taking Essiac six weeks ago and already the area has shrunk to half the size. Main herbs are Burdock, Sheep Sorrel, Slippery Elm, and Indian Rhubarb. Another proven herbal cure for skin cancer is "Black Salve" made from the plant, "Blood Root." I bought some and at first was going to use that but the area is close to my eye. Blood Root will pull out the whole cancer within a few days but I prefer not to use it on my face. Another Happy Monday, Dear Bloggie Friends. Great Post My Dear Manzi!! Thank you so much for the herbs you sent me. I have enough to do a liver cleanse with you once a month for probably 6 months. I sure do hope that Essiac Works well for you. Thanks for the link love. Love to you!! I recently started seeing an MD who practices holistic medicine. He prescribed an herbal formula for me for my a-fib and irregular heart rhythm. It is the only thing that has made my heart feel normal again. He mixes it himself. It contained Gingo, Skullcap, Motherwort and Hawthorn Leaves. I'm a believer even if there's part of me that's still skeptical. I'm so happy you found something to give you relief. I must say that herbs are what works for me. Sound like a good doctor. I see a holistic MD and I'm sure what she put me on has helped keep my Crohn's disease in remission. I'm so happy you found herbs. I worried about you and your gall bladder. Congrats on completing your cleanse AND your skin cancer clearing up. I LIKE your herbal postings. I am down to only a couple of prescription meds and look forward to the day that I can get off of all of them!!! Hi Manzanita .. what an interesting post - and it's always interesting to know and read about others' experiences ... I'm sure I need a liver detox ... but for now I'll rest on my laurels. But it's good to know you're here .. Yes, we have to pay attention to our livers. It's often difficult to gear up to a detox. That is great news because so many people eat all processed food, due to not being educated in nutrition. Eating healthy is the way to prevent disease. I'm so happy that you are finding your way to herbs. Would prob cure your migraines too. I used to take the apricot seeds years ago as a cancer preventative but then they were taken off the market because Big Pharma couldn't have that happening. Now I notice they can be purchased online again but I don't see them in the health food stores. I am printing out this post, and researching online. Thanks, Bea. I have a hefty herb library and I always am doing research in herbs. Right now, our health food store is discontinuing a great many medicinal herbs (half off) so I am stocking up. I am tempted to try the liver thing, but would rather not screw myself up any more at my wing. May just start with wormwood and see how that goes. 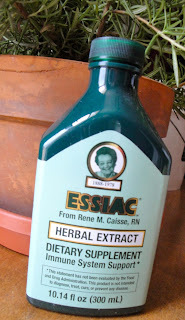 The Essiac I have, but says not to use with bowel issues, so yeah avoiding that too. Geez, dumb body of mine. That Black Salve though, after looking at what people did to themselves with that, no way hosa lol but big pharma pills can shove it all the more. May have to order some apricot seeds as mentioned above. Hopefully the Essiac rids you of your cancer spot fully too. I have a bag of apricot kernels but I haven't taken them in a while. Dummy me.... that may help along with the Essiac. I'm not having much of a reaction this time on the 4 herbs. I prob got it all out last month. I think I told you the healing time was brief but one of the worst I've ever had. Haha. But we like that, we know it's really going after the toxins. I would use black salve on my body, just not my face but I've seen some good results there too. It leaves a hole where it pulls the cancer out but heals very quickly, it seams. Take care. Dearest Manzi, thank you for sharing this precious information about liver cleanse! I prefer herbs for health and beauty, too! It's great you've found this remedy and it works successfully for you, and wish you a perfect health! Thanks for tuning in on the herb post. I thought you were a student of herbology too because you like all things natural. Healing one's self is a full time job but it is an actual cure.... not a band aide as when one does chemical pills. Good health to you. My daughter-in-law gets terrible migraines. Can you tell me more about apricot seeds--amount to take, where to buy, etc? Do you read Robin's blog? She wrote above. She gets terrible migraines too but they seem to be under control now. She may have more info for you than I do. I'm pretty sure I got my apricot kernels through Amazon but Robin had a link too. It was apricotpower.com. Do you recall when I did the A-Z on the Hunzas? Before civilization discovered them high in the himalayas, apricots were their main source of food..... for oil, dried them, ate the pits for good health. But then when roads were built to reach them and people from the outside world came in, they gave up some of their old ways and began to get ill. All summer I took 7 a day but then I moved and forgot about them. I will start again. May help with the skin cancer. Taking herbs is such an individual healing. If they are sold on Amazon, I like to read the comments and you can get a feel for it from the ones who write in.Good luck to your daughter. I hope she finds relief. Fishducky, if your daughter-in-law gets migraines based around on her cycle, it is likely a hormone thing. I suggest taking Estrium made by Metagenics. Back when mine were just a few days a month that made a HUGE difference. Now, I still take the Estrium, but I also have eliminated processed foods, more good fats (olive oil, avacados, etc), more green veggies, less starch, multi-grain breads, and only Greek yogurt (without the fruit in the package) for dairy. Although, almond milk is also okay. Nuts are also good. I also take a boatload of vitamins. Most important a fish oil with Omega 3s, Vitamin C (2000mg/day), Vit D3 (I take 2000IUs, but this is different for everyone), Calcium Citrate, Chelated Magnesium, liquid B12). I have a neighbor who got terrible migraines and said Petadolex has made all of the difference for her. I tried it and didn't help me much, but everyone is different. I would suggest your DIL look for a doctor who specializes in nutritional analysis. Mine is an MD, but often DOs are more inclined to take nutrition seriously as a component for healing. Thank you--I will pass your information along to her!! You are a shining example for the use of herbs my friend! It's so good to take natural products. The Doctor put me on tablets in the summer and I was so ill. I honestly thought I was dying, until I put two and two together and came right off them. I felt so much better within a couple of days. It's amazing how prescription drugs can do such bad things to our bodies Keep spreading the word! So good to hear from you. I hope you are hearing good news with your daughter. I knew you were ill this summer. Too bad a doctor makes it worse sometimes. I'm happy you are better. There are so many side problems with the drugs and they don't always tell you. Thank you for the meaningful comment. It seems like livers can take a lot abuse before they complain. I don't know what I ever did to mind, but she's not too happy sometimes. I am actually a believer in herbs. I have a good friend who absolutely swears by them. I do admit that I should utilize them more. You have a smart friend. Ha There is fairly large bulk herb section at the health food store. I always meet interesting people there among the jars. So far I have only leaned on Echinacea which I swear by but I am open. I read about wormwood recently. You and my son are alike. He reaches for the Echinacea at the first sneeze.Wormwood is wonderful. Well at least it has the best intent. the world would be much more heathy if everyone still ate herbs for healing. Could you possibly just dab the black Salve on the spot directly with a cotton swab or similar? I don't live by herbs, but I drink peppermint tea, ginger, chamomile, licorice tea; not all the time, I'm a coffee person. And I use parsley and oregano in my cooking. I have willowbark tea for pain relief, but if the pain is severe and comes on suddenly, I'll take an over the counter pill or two. I used to grow my own chamomile and lemon balm for teas, and sage too. Greetings, Herb Woman. I'm always happy when I hear of someone actually growing their own herbs. I drink peppermint tea too. Last night I ate dinner later than usual so I sipped some peppermint tea before I went to bed. Settles the stomach and helps to sleep too. As far as the black salve..... I really want to use it but the healing extends a little beyond the actual cancer. It's very thorough and really gets it all. Then it goes deep as it pulls out the whole cancer and all it's tendrils ..... but leaves an actual hole that always heals up without a scar. But mine is above my ear and close to my eye and the blood root goes where it's needed. If it were on my arms or legs, I wouldn't hesitate to use it. But yes, that is how you use the salve, just dab it on the sore. If the mole or sore or whatever, isn't cancerous, it does nothing. I was going to test it out. I have a plain old mole near my back and my acupuncturist put a dab of the salve on it to test if it was cancer but it did nothing. The spot on my face is entirely different and both the acupuncturist and my health provider knew it is cancer. The Essiac seems to be doing the job as it has shrunk to half the size and is gradually flaking off. It goes into the soft tissue and you should not use it on the nose. Black salve is remarkable but one has to use utmost caution when using it. Thanks for the meaningful comment, River. It's the only thing I grew up with. No one in my family ever saw an allopatic doctor. I'm not adverse to learning more about herbs. I've never been one to take medicine, but have found myself needing an OTC for migraines. I'd love to find a natural remedy that worked on them just as fast. You used the word "fast." Yes, the allopathic drugs act fast but there is no cure. The illness returns. Herbal medicine may take longer, but it does produce a cure. I have a favorite herbal doctor, Michael Farley and I took his herbal book to the health food store where I was buying up many of their half price bulk herbs. I just like to have them on hand and can't pass up a bargain. Ha As I was glancing through the book, I noticed many herbs said they were used for migraines. I never pay much attention as I don't have them. I bet there is some herb out there that would produce a cure for you. Good luck in find something that cures your migraines. They must be a terrible burden. I'm so sorry to hear about your son's affliction. I do understand because I too, raised a child with special needs. I had never heard of Sturge-Weber Syndrome so I had to look it up. I've noticed children with that wine-stain birthmark. I certainly agree that I woulldn't want a child burdened with chemicals for all their life. There is also Homeopathy that seems to bring about cures where it appears impossible. Or maybe a relief for the headache right now. I just read a book, "Impossile Cure", by Amy L. Lansky, PHD. Her son was "cured" of autism by using homeopathic medicine. I've dabbled in it a bit, (mostly for my pets) but my knowledge is scant. Have you ever looked in that direction? I wish I had the magic answer to so many medical problems but I've always insisted on periodic cleanses and lots of de-worming for my whole family and that always seemed to keep everyone fairly healthy. No shots, no drugs. I sincerely wish you luck on your quest. I am sure there's an answer. I'll do a little digging on my own. I do believe you have to take very good care when using herbs because they can be very powerful. Used incorrectly, it can harm. I don't think many people realize that. I wish I had your knowledge.